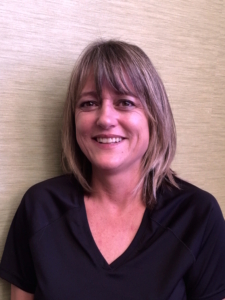 Meet Our Team of Senior Move Specialists - Here to Home Inc. It is so important to have trusted advisors when moving an older parent or family member. We would be honored to help your family navigate moving to a senior community. Take a moment to read more about our team below. Little did I realize that my work as a museum exhibition designer would lead me to owning my own Senior Move Management business, but let me explain. I was the Director of Exhibit Services at The Franklin Institute where part of my duties were to oversee the installation of traveling exhibitions. In 2007 we had the tremendous task of installing 20,000 sq ft of exhibitiry and artifacts for the King Tut exhibition that was touring the world. As I stood on theloading dock day after day watching 27 trucks unload their precious cargo, I was confident that we had planned well and everything would be in its place when the doors opened. So, when my parents decided to move from their home of 3o years, the move went like clockwork. It went so well my Mom said to me “You should do this for a living” and it was then that I realized there was a business here. Soon after Here to Home became a reality and now 9 years later, it was one of the best decisions of my life. I love my work. Lee Ann will fool you. 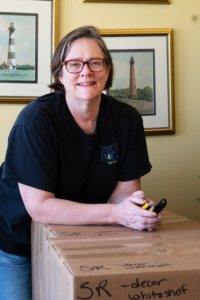 Sweet and caring through and through, but with nerves of steel when it comes to making sure our clients’ moves run smoothly. 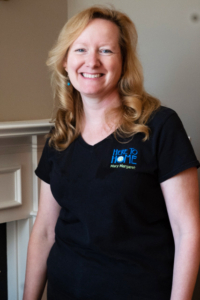 She can be tough with contractors with a smile on her face and a good attitude of “Let’s git her done.” Born and raised in Catawba County, she worked in the furniture industry before joining H2H and brings a rich understanding of the best use of furniture in a new home. Organized? Mary Margaret is more than organized. She takes charge of any storage space in a new home and effortlessly whips it into shape. From kitchens to bedroom closets to linen closets to utility rooms, she makes sense of how we use space. Having worked for a local organizing business before joining Here to Home, she brings proven solutions to taming areas that are potentially overwhelming. But more akin to her true abilities is the fact that she has raised two boys, a Labrador puppy (and a husband). She can take on anything! Sarah Williams lead the Raleigh office of Here to Home before she died March 28, 2013 due to complications associated with Lupus. Our clients called her a Godsend. We don’t take compliments like that lightly. It’s an honor and responsibility being a Godsend! She had more patience and quiet understanding than anyone I know. People felt at ease around Sarah. She was drawn to this industry because she liked being there for people during stressful times. She made their lives easier. She truly embodied the spirit of “here to home” by accepting people where they are with all their disorganization and humanity and transitioning them calmly to their new home. In honor of her generous spirit, H2H contributes 2% of its profit annually to The Lupus Foundation.